Whitehawk Camp is one of Britain’s earliest stone age monuments. The hill was chosen some 5,500 years ago as the site for a series of circular ditches and banks which marked the hill as an area for feasting, burials and other activities of a ritual nature. This curious and obviously non-defensive arrangement gives these sites their name: causewayed enclosures. They represent the earliest ritual circles in northern Europe and predate later stone age enclosures like Stonehenge and Avebury by up to 1000 years. They all appear to have been built around 3500 B.C. 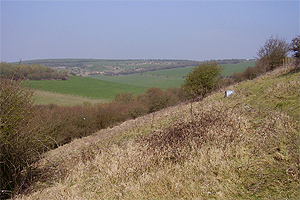 The stone-age people of Sussex were probably the descendants of hunter gatherer groups who had occupied the landscape since the end of the last ice-age. Their lives were in the process of going through major changes including an increasing reliance on domestic livestock, cultivated plant foods and a more stable pattern of settlement. This shift towards an agricultural way of life was reflected in an increasingly visible expression of ritual activity; first through the construction of long burial mounds and then through the creation of causewayed enclosures, of which there are six in Sussex. Archaeologists have explored only a small portion of Whitehawk Camp. Within the fill of the surviving ditches the remains of four complete burials have been found alongside huge numbers of stone age flint tools, pieces of pottery and the bones of ox, cattle, pig, deer and other fragmentary human remains. These suggest the consumption of large amounts of meat as part of the activities which took place on the hill. The site was important enough to become the final resting place of members of the local tribes and these included the bodies of an eight year old child and a young woman buried alongside the remains of her new born child. The details of Stone-age religion are largely unknown, but the archaeology suggest an emphasis on seasonal gatherings, the importance of the ancestors, tracking of the seasons through astronomical observation and the marking of territorial ownership. Whitehawk Camp is a nationally important site which requires careful management and a programme of works to both secure the site from further damage and remedy previous intrusive works. Improvements aimed at enhancing the site as an education and leisure facility can then build on this programme to widen awareness and appreciation of this unique resource within the city and beyond. 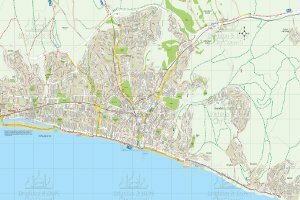 Whitehawk Hill, with its commanding position and excellent views would have been pivotal in the lives of the area's farming groups and survives today as a monument to an ancient culture which began the process of developing complex agricultural societies in Britain. The hill is managed by the council for people, wildlife, the historic landscape and allotments. It is a Scheduled Ancient Monument (SAM) protected by law under the Ancient Monuments Act of 1976 which prohibits any unlawful destruction of the site. There is also more information about local wildlife on our City Wildlife website. The 21 and 37 buses stop nearest the site. Further information and timetables available from the Brighton & Hove Bus company.